This is the third installment of Book Club, bringing you books of all kinds to feed a creative & beautiful life. This segment runs the first Friday of every month (or in this case the second because the first came way too early!) to stimulate creative energy & passion for your weekend & throughout the month ahead. 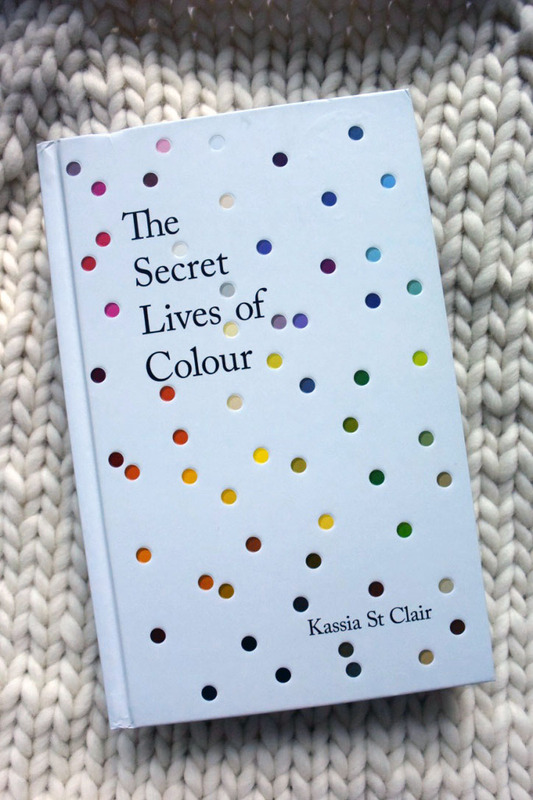 Please feel free to discuss the book (or give book recommendations) in the comments, & enjoy this month's pick: The Secret Lives of Colour by Kassia St Clair. It's no secret that I love color. Currently my one weekly blog segment is all about color, I took a Color Theory class my freshman year of college (four years ago!) & still haven't managed to shut up about it, & I will talk complementary colors FOR DAYS if my friends/family would let me. I. Love. Color! So when I saw this book on a European knitter's Instagram feed (I totally forgot who! ), I knew I needed it IMMEDIATELY. So I went to Amazon, & much to my distress I saw that the book was not yet available in the United States. It was first published in the UK (hence, coloUr) & is due for release in America on October 24th (the day after my birthday! It's like a gift), but I couldn't wait that long. So I ordered a British copy from a third party seller & I'm so incredibly happy with my decision. St Clair opens with a brief background how we experience color: color vision, light vs. pigment color, how hues relate to one another, & how our language & politics influence the way we see color over time. It's a lovely little handbook to refer back to again & again, & very useful for someone who hasn't taken a Color Theory class (AKA most of the world). She then dives into in-depth profiles of 75 shades, each grouped into larger categories (e.g. yellow, pink, green, etc.). Each hue is given about 2 pages or so in which she tells a snippet of its history - in fashion, art, science, who loved/hated it, how the pigment was sourced, & so much more. She has compiled a wealth of information that is both fascinating and wildly entertaining. I learned about the bizarre brown color "mummy" that is literally created by grinding up flesh & bones from mummified bodies, that there is a giant emerald (called the Bahia emerald) valued at $400 million & currently at the center of a lawsuit in California between over a dozen people who claim rightful ownership, that only 2% of the world's population is naturally blonde, & so much more. While I've read the book all the way through, I'm sure I'll come back to it to peruse & I'll learn a new fun fact each time. To top it all off, the book itself is a work of art. It is beautiful in its simplicity - there are no fanciful or unnecessary elements to detract from the colors themselves. The cover is like fun little confetti bits of rainbow, begging you to dive in & read. Each hue's few pages have a edge border of the hue (which creates a lovely ombre edging), & the typography is kept simple & consistent. 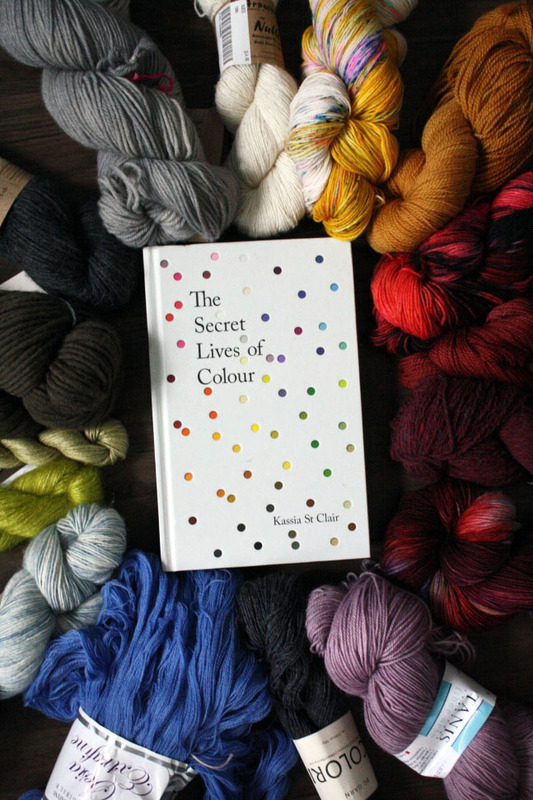 The Secret Lives of Colour is St Clair's first book (although she says she's working on more!) but she is an active journalist who frequently contributes to The Economist, Elle, & many more publications. Some of my favorite of her pieces are this little one on wool (how perfect! ), Fonts and cities: a love story (I'm starting to think she writes just for my entertainment), & this lovely little sound snippet on color ownership (yeah, that's a thing). "The baking late summer of 1888 was the happiest of Vincent van Gogh's life. He was in the 'Yellow House' in Arles in the south of Frances, eagerly awaiting the arrival of his hero, Paul Gauguin..." (page 78). This quote begins a lovely little anecdote about Van Gogh's sunflower paintings & his use of the hue chrome yellow. He was basically so excited about Paul Gauguin arriving that he wanted to fill his entire studio with yellow sunflower paintings to make his friend feel welcome. The bummer part of the story is that he & Gauguin had a falling out a few months later & eventually Van Gogh committed suicide. But so much of his beautiful art remains, & these his sunflower paintings are some of my favorites, so I like to think about this side of Van Gogh & his happy times instead of dwelling on the earless sad times. My takeaway is based off of this quote about the color russet: "Russet is a reminder that a colour lives more in the imagination of a generation than bound into a neat colour reference" (page 246). I came away from this book with a more culturally subjective understanding of color. I've always wondered whether the yellow I see is the same yellow that you see (because how could we ever know?! ), but that was an interpersonal thing confined to me & you. Now, I look at color as something bigger - something that binds cultures & generations in a way that few other things can. I mean, think about it - I think every person in my generation (the tail end of millennials) could pick out the Facebook blue from the Twitter blue. Even just recently, the distinct blue of the ACLU ribbon is becoming a kind of icon. And the blue & black/white & gold dress? I don't think we'll ever forget that internet debacle. Point: color is a powerful, unitary force & I think we should pay more attention to it & embrace it.